Protests in February that led to the fall of four canton governments revealed deep popular disaffection and an urgent need for reform. But the Bosnian political elite’s lack of vision goes along with ineffective institutions and a constitution that impedes political change. A suffocating system of ethnic quotas contributes to bad governance and no longer meets any of the three communities’ interests. In its latest report, Bosnia’s Future, the International Crisis Group examines factors pushing the country toward disintegration and outlines alternative scenarios based on democratic reform from within. Bosnia’s constitution (Annex 4 to the Dayton Peace Agreement) defines two state entities for three constituent peoples: Bosniaks, Croats and Serbs. It is based on a mix of ethnic and civic identity that is open to abuse and has led to paralysis in political and administrative institutions. The state’s political communities – self-defined groups of like-minded citizens that overlap but are not identical with the ethnically-based constituent peoples – are left without effective representation. Bosnia needs to break from its system based on constituent peoples and implement a constitution based on a territorially defined federation, without a special role for constituent peoples but responsive to the interests of its three communities and the rights of all citizens. The head of state should reflect Bosnia’s diversity, something a collective does better than an individual, and should be directly elected. Ethnic quotas should be abolished. Instead, representation should reflect self-defined regions and all their voters. The ten cantons in the larger state entity, the Federation of Bosnia and Herzegovina, are an under-performing, superfluous layer. They should be removed, together with a number of inefficient state-level agencies and institutions. The cantons should be replaced by a new form of autonomy for Croat regions, while the state will need new capacities as it prepares for European integration. 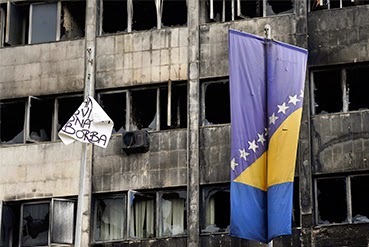 The European Union (EU) and the wider international community should support Bosnia without high-handed interventions. The UN should close the Office of the High Representative and dissolve the Peace Implementation Council. The EU should welcome a Bosnian membership application as a first step towards eventual accession. “Bosnia is torn between an outmoded ethnic model and an easily-abused civic model. It needs to find a new approach incorporating parts of both and based on federalism” says Marko Prelec, Executive Director of the Balkans Policy Research Group and former Crisis Group Balkans Project Director. “To survive as one state, Bosnia must conceive new foundations. Agreement may take years and much experimentation, but the search should begin”. “Dayton acts as a mirror of the past, not a roadmap for the future. It keeps the country trapped in ill thought-out, internationally-imposed tasks”, says Hugh Pope, Europe and Central Asia Deputy Program Director. “It is time to treat Bosnia normally, without extraneous tests or High Representatives”.